Wedding day style.. Obviously all eyes are generally on the bride BUT the groom and his ushers of course do like to look their best. They are part of the main bridal party after all. I told my best friend that I was writing this post, she was my chief bridesmaid, I said that I wasn't really too sure about what angle to take and her response was classic. They think they get a choice in what they wear but really they've just been cleverly manipulated by the bride to think that (what can I say she has a way with words!) When it boils down to it the bride and the colour scheme chosen generally dictates to the groom and his party what they wear. For our wedding we had a fuchsia pink and black theme, so the men coordinated in with that by wearing pink cravats and white flowers and for my husband a cream cravat with a pink flower. It all looked very smart I think. I love this article on vows and venues which talks about the various different styles of suit that can be worn and what your colour selection of accessories means. So as we chose fuchsia pink as a main colour implies a fulfilling and sensitive relationship. Ahhhh how sweet. There is alot of choice for me these days such as the traditional morning suit, to the tux or even braces and bow tie for a modern twist on something that otherwise can be quite traditional. Alot of men, unless working in a big corporation, will perhaps not get the chance to wear a beautifully made suit so to wear one for a wedding is the perfect occasion. 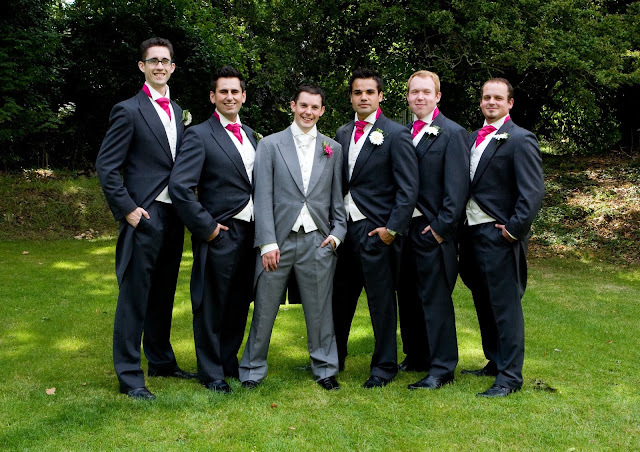 I think deep down men do like to look the part and be suited and booted for a wedding. You can view the infographic below, although it is a little small! What would you want your man to wear on your wedding day? Did you go traditional or modern? That's such a lovely photo! When you need to step back.